12/02/2018 – The Head of the Secretariat of the Global Forum on Transparency and Exchange of Information for Tax Purposes Ms. Monica Bhatia visited Kigali on 8-9 February 2018, to launch the induction programme for Rwanda, which became a member of the Global Forum in December 2017. The team which also included Mr. Ervice Tchouata, Tax Policy Analyst, held bilateral meetings with Mr. Claver Gatete, Minister of Finance and Economic Planning, Mr. Johnston Busingye, Minister of Justice and Attorney General, Mr. John Rwangombwa, Central Bank Governor and other high level officials, during the two days. Minister Claver Gatete, reaffirmed the importance Rwanda places on the fight against tax evasion in raising domestic revenues and ensuring Rwanda’s development. He welcomed the induction programme and conveyed the country’s resolve to take the appropriate steps to ensure that international tax cooperation is a priority in Rwanda. 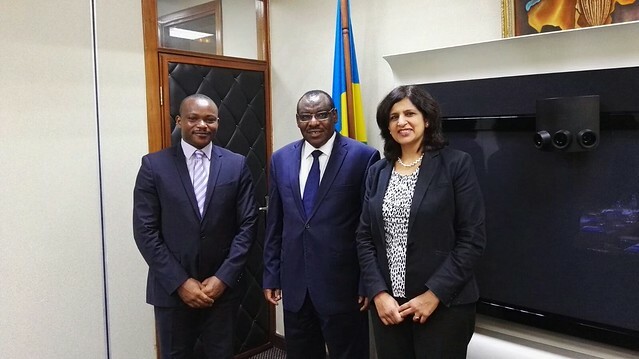 Ms Bhatia assured Rwanda of the support of the Global Forum in implementing the international standards of tax transparency and in benefitting from a more transparent global tax environment including automatic exchange of information. The Global Forum representaives discussed with Minister Claver Gatete its ongoing work in Africa carried out through its Africa Initiative, the Ministerial Yaounde Declaration, which is a call by African high level representaives to tackle illicit financial flows through international tax cooperation, as well as Rwanda’s priorities as the chair of the African Union this year. During the visit a technical workshop attended by more than 20 participants was also organised with Rwanda’s Revenue Service and other stakeholders including representatives from several ministries and organisations. Apart from creating awareness of the international standards, the workshop focussed on Rwanda’s benefits in implementing the tax transparency standards and the need to anticipate the peer review scheduled to be launched in the first half of 2021. At the end of the workshop discussions were held on a roadmap for Rwanda to implement the standard of exchange of information on request and automatic exchange of information. The Global Forum has similar induction programmes ongoing with 20 other member countries.